The 2018 Machine Learning in Oil & Gas Summit presents speakers from the major tech companies along with thought leaders in the energy industry for an insightful and engaging blend of innovation, geoscience, and engineering. The oil and gas industry has always been a ‘Big Data’ business. Now, Machine Learning, Data Analytics, Cloud Computing, and the Industrial Internet of Things (IIoT) are rapidly changing the ways that hydrocarbons are discovered and developed. New technology is enabling innovators to create and discover more value through entirely new workflows that were not available even a few years ago. And, the big technology companies are now teaming with leaders in the oil and gas industry, which promises to accelerate changes. 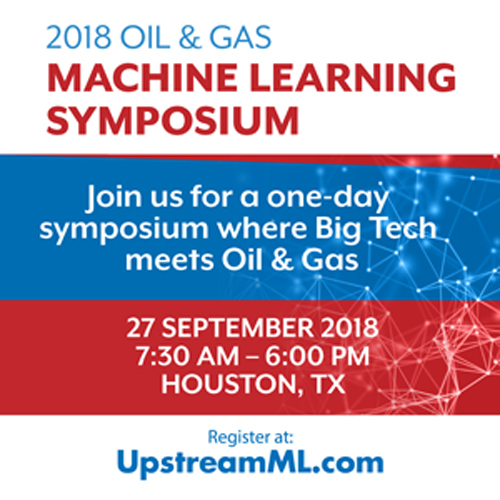 Don’t miss speakers from companies across both the upstream oil and gas industry and the broader tech section with hands-on knowledge and application of Machine Learning and AI share their insights at the 2018 Oil & Gas Machine Learning Symposium. HEAR the industry’s leading thought leaders from companies that are developing and applying machine learning in upstream. Representatives from Amazon, Anadarko, IBM, Microsoft, Repsol, Shell, TGS, and others will describe their visions of technology strategies that will shape the future of energy. ENGAGE with thought leaders from the super-majors to independent producers who have launched data analytics and machine learning initiatives. LEARN how service and software companies like TGS and Geophysical Insights are developing solutions that offer their customers new solutions for both data and applications.